Work. – the full stop in the titlepiece is deliberate – is the magazine for Chartered Fellow members of the CIPD (Chartered Institute of Personnel and Development), the professional body for human resources and people development, published by Haymarket Network. And while long-form articles on political power plays, the roots of the gig economy (in Shakespeare and Dadaism) and the ethics of supply chains provide the magazine’s journalistic credentials, it is the relationship between probing content and striking images that differentiates Work. 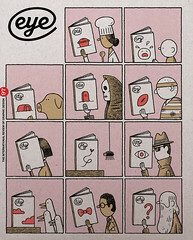 from most business-to-business periodicals. This alliance starts with the magazine’s covers, which feature arresting artworks – from a taxidermy dog declaring its own death (David Shrigley’s I’m Dead) to Picasso’s Celestina and Michelangelo’s Tomb of Giuliano de’ Medici. These works are then translated, via a blurb on the back cover, into a workplace-related parable, creating a kinship – generally through the method or trials of production – between high culture and business. 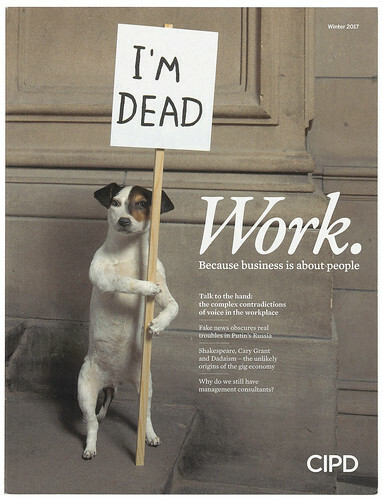 Cover of Work., winter 2017, with a photograph of David Shrigley’s I’m Dead (2010), taxidermy with wooden sign and acrylic paint. 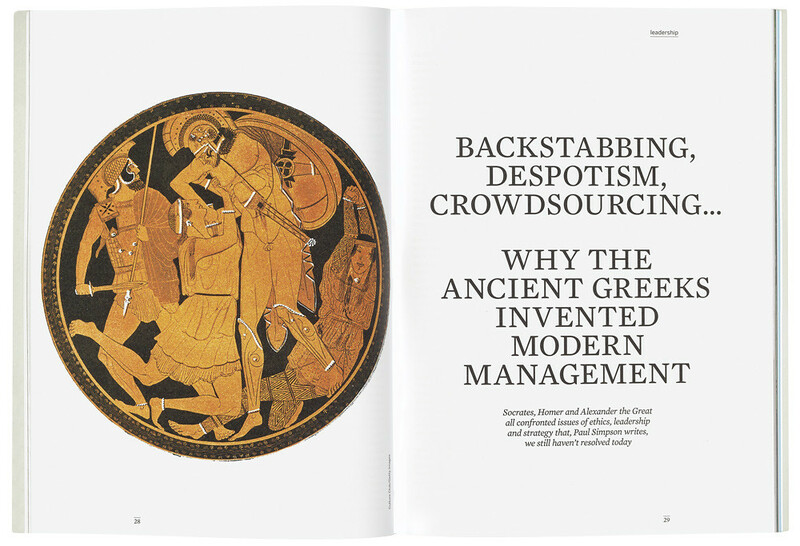 Top: Classical imagery for the opening spread of Paul Simpson’s ‘Lessons from the Greeks’, Summer 2018.